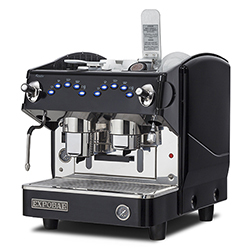 Original Mediterranean soul for all our espresso machines. 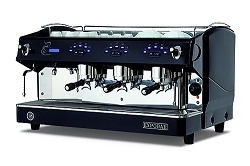 From premium level and barista-focused solutions, to reliable and highly efficient models. 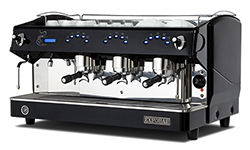 Automatic espresso coffee machine with 3 groups, electronic switchboard to control the coffee dosages volumetrically, with automatic water filling and 1,5 Litres separate boiler and 1200 W. for each brewing group and copper boiler with 17,5 litres capacity and 6000 W. only for the hot water tap, the two steaming pipes end for preheating the water for the separate boilers. Two steam tap (stainless steel) and one hot water tap. Display: advertising, automatic dosing of hot water, time management, and memorization of total brewed coffees, daily automatic switch ON/OFF of the coffe machine, control of the boiler temperature through display. 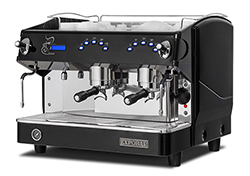 Automatic espresso coffee machine with 2 groups, electronic switchboard to control the coffee dosages volumetrically, with automatic water filling and 1,5 Litres separate boiler and 1200 W. for each brewing group and copper boiler with 11,5 litres capacity and 3050 W. only for the hot water tap, the two steaming pipes end for preheating the water for the separate boilers. 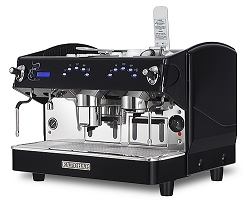 Intelligent management of the power input by the machine, so the total consumption never exceesds 3620 W. Two steam tap (stainless steel) and one hot water tap. Display: advertising, automatic dosing of hot water, time management, and memorization of total brewed coffees, daily automatic switch ON/OFF of the coffe machine, control of the boiler temperature through display. 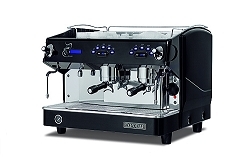 Automatic espresso coffee machine with 3 groups, electronic switchboard to control the coffee dosages volumetrically, with automatic water filling and copper boiler with 17,5 litres capacity with heat exchanger per group and cleaning valve. Two steam tap (stainless steel) and one hot water tap. Display: advertising, automatic dosing of hot water, time management, and memorization of total brewed coffees, daily automatic switch ON/OFF of the coffe machine, control of the boiler temperature through display. 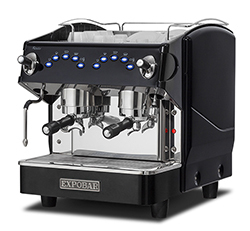 Compact automatic espresso coffee machine with 1 group, electronic switchboard to control the coffee dosages volumetrically, with automatic water filling and copper boiler with 6 litres capacity with heat exchanger per group and cleaning valve. One steam tap (stainless steel) and one hot water tap. 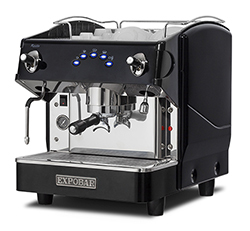 Compact automatic espresso coffee machine with 2 groups for capsule system, electronic switchboard to control the coffee dosages volumetrically, with automatic water filling and copper boiler with 6 litres capacity with heat exchanger per group and cleaning valve. One steam tap (stainless steel) and one hot water tap.